Gas prices are pretty low at the moment, but Americans love to drive so every cent we can save when we fill up the tank means more money to spend on other things. For many years you could get a branded credit card from oil companies and for many of us, those cards might have been our introduction to the world of credit cards. But many of them could only be used at those companies’ gas stations. It was limiting for consumers and as their popularity declined they became a headache for the oil companies. 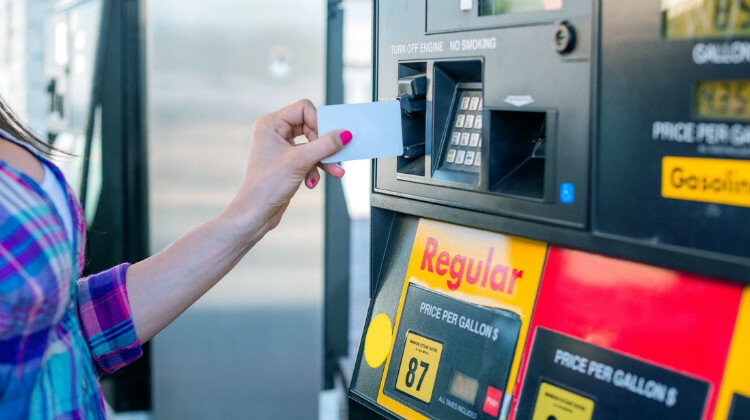 Most gas companies got out of the credit card game so if you want to save money on gas, what you need is a rewards card that offers a generous percentage of cash back on purchases made at any gas station. We read the fine print for you and found the best gas credit cards. This card is only available to Costco members but shopping at Costco has its own rewards so if you’re looking to save money not just on gas but on bulk items and cheap in-store snacking, this is a great card to consider. Gas Rewards: You will receive 4% cash back on gas purchases up to $7,000 per year, and 1% cash back thereafter. Additional Categories: You will receive 3% cash back at restaurants and on eligible travel purchases, 2% back on Costco purchases, and 1% back on all other purchases. Fees: This card has no annual fee and a 3% foreign transaction fee. There is an introductory APR of 0% on all purchases for the first seven months. After that, there is an APR of 15.49%. Credit Score: You need a score of “Fair” to be approved for this card, a score above 650. Gas Rewards: You will receive 3 points per $1 spent on gas purchases. Additional Categories: You will receive 2 points per $1 spent at restaurants and 1 point per $1 spent on all other purchases. Additional Benefits: If you have a Wells Fargo checking or savings account, you will receive a bonus of 10% of all the points earned each year. As a card holder, you are eligible for exclusive offers on airline tickets, hotels, car rentals, and cruises. Points can be redeemed for travel, gift cards, cash back, and merchandise purchased through Wells Fargo’s shopping portal, Go Far Rewards Shop. Fees: This card has no annual fee and a foreign transaction fee of 3%. There is an introductory APR of 0% on all purchases and balance transfers for the first fifteen months! After that, there is a variable APR of 13.24-25.24%. Credit Score: You need a score of “Good” to be approved for this card, a score above 700. Gas Rewards: You will receive 3% cash back on gas purchases with no limit. Additional Categories: You will receive 6% back on the first $6,000 spent on groceries. After reaching the $6,000 limit, you’ll receive 1% back on groceries. Super stores like Walmart and Costco are excluded from this as are liquor stores. You get 3% back at qualifying department stores. All other purchases will get you 1% back with no dollar limit. Additional Benefits: American Express provides protection from damage or theft for up to 90 days after purchase. The card will provide up to a one year extended warranty on items that come with a manufacturer’s warranty of five years or less. This card even provides return protection! If the merchant refuses to accept a return, American Express will refund the full purchase price on eligible items valued up to $300. Sign Up Bonus: You will receive a $150 statement credit after spending $1000 in the first three months. Fees: The card has a $75 annual fee. There is 0% APR for the first 12 months and then it is a variable 13.24-23.24%. There is a foreign transaction fee of 2.7%. Gas Rewards: You will receive 3% cash back up to $2,500 each quarter, combined with spending at grocery stores and warehouse clubs. Additional Categories: You will receive 2% cash back at grocery stores and warehouse clubs, and 1% cash back on all other purchases. Additional Benefits: If you have a Bank of America checking or savings account, you will receive a bonus of 10% each time you redeem cash back and have it deposited into your account. There are no rotating categories to keep track of and rewards don’t expire as long as your account remains open. Sign Up Bonus: You will receive a $100 online cash rewards bonus after spending just $500 in the first 90 days of opening the account. Fees: This card has no annual fee and a foreign transaction fee of 3%. There is an introductory APR of 0% on all purchases and balance transfers for the first twelve billing cycles. The balance transfer must be completed within 60 days of opening the account. After that, there is a variable APR of 13.24-23.24%. Gas Rewards: You will receive 1% cash back on gas purchases and 1% back when you pay your bill on time each month. Additional Categories: None; the 1% on purchases and for on-time payments is the same across the board. Additional Benefits: There is no limit on the cash back you can earn and it doesn’t expire as long as the account is open. You can redeem your cash back in the form of a check, statement credit, or gift cards. Fees: This card has no annual fee and a foreign transaction fee of 3%. There is an introductory APR of 0% on balance transfers for the eighteen months! The APR is a variable 13.24-23.24%. Gas Rewards: This card gives a generous 5% back on gas during a quarter of the year up to $1,500. Additional Categories: The 5% applies to rotating categories that include movies, restaurants, and Amazon purchases. For the rest of the year, you receive 1% cash back on all other purchases. Additional Benefits: Your monthly statement includes a free FICO score so you can monitor your credit. There is no late fee if you make your first payment late. Sign Up Bonus: At the end of your first year of membership Discover will match your cash back! Fees: This card has no annual fee and no foreign transaction fee. There is an introductory APR of 0% on both purchases and balance transfers for the first twelve months. After the introductory period, the APR is a variable 11.24-23.24%. Gas Rewards: You will receive 1.5% cash back on gas purchases. Additional Categories: This card has no categories; you receive 1.5% cash back on all purchases. Additional Benefits: Your rewards don’t expire as long as the account remains open. Sign Up Bonus: You will receive a $150 bonus after spending $500 in the first three months. Fees: This card has no annual fee and a foreign transaction fee of 3%. There is an introductory APR of 0% on both purchases and balance transfers for the first fifteen months. After the introductory period, the APR is a variable 14.24-23.24%. If you are already a Costco member, the Costco Anywhere Visa Card by Citi is a great card. It has the highest cash back percentage that isn’t part of a rotating category of any of the cards we reviewed. If you aren’t yet a Costco member, this card is a good reason to join! In addition to the generous cash back on gas, it gives a nice 3% cash back on restaurants and travel as well. Keep in mind this card does have a 3% foreign transaction fee though so it will be best used for domestic travel. If you like to use your gas to drive around and buy groceries, the Blue Cash Preferred Credit Card from American Express is going to save you some serious money! You get 3% cash back on gas purchases and 6% cash back on groceries. Gas prices are low now but as we’ve seen before, that doesn’t last forever. By choosing the right card, you can save money at the pump no matter what prices are doing. Happy driving!